The New York Yankees are to Baseball as the Bulls are to rugby in South Africa, and Yankee Stadium feels a little like Loftus. They have won 27 World Series Championship, 16 more than the nearest rivals the St. Louis Cardinals. 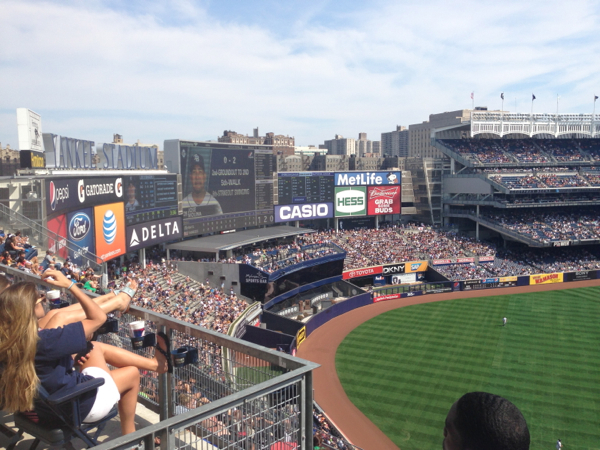 The Yankees last World Series victory was in 2009, which was their first season in the brand new stadium. 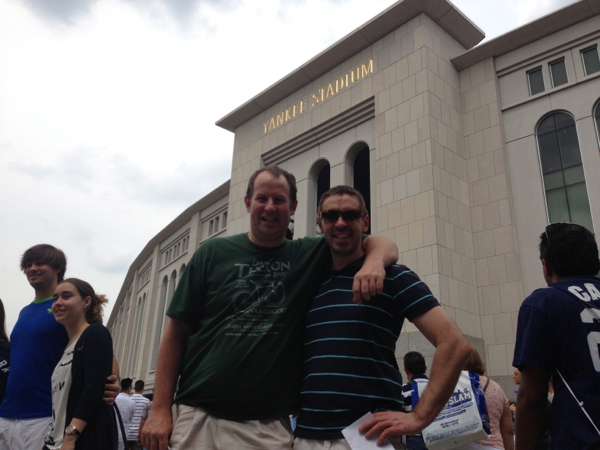 Myself and Jano outside Yankee Stadium in New York! My first baseball game I have ever attended was at the old Yankees stadium in 2007, which was just across the road from the new stadium. Construction on the new stadium had begun in 2006 already. The old Yankee Stadium was often referred to the house that Ruth built, after the Yankees most famous player Babe Ruth. Which was bought from their mortal enemies the Boston Red Sox in 1919. That trade is believed by Red Sox fans to be one of the reasons behind their 86-year World Series drought. 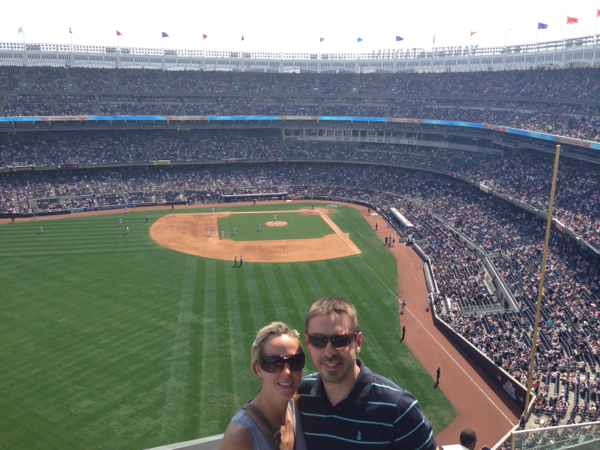 The new Yankee Stadium has all the bells and whistles. Escalators and elevators are in abundance to help move the crowds to their seats. The walkways are wide and there are food outlets everywhere. The new Yankee Stadium can hold over 50 000 people, and Yankee fans are every bit as passionate about there team as Bulls fans. It must be intimidating for a visiting team to play at the Bronx zoo (one of the many nicknames from Yankee Stadium). 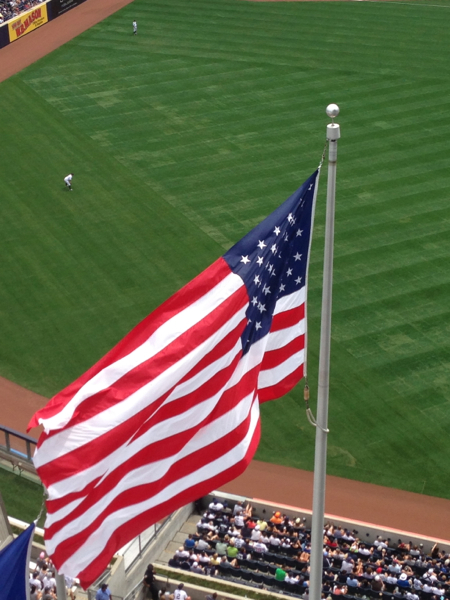 The Yankee’s record shows dominance rarely seen in any sport. As with most baseball stadiums Yankee Stadium is steep in tradition and the Yankees rich history is on display through this wonderful modern masterpiece, which cost $1,5 billion to build. Jano and Kerry with the baseball diamond in the background. 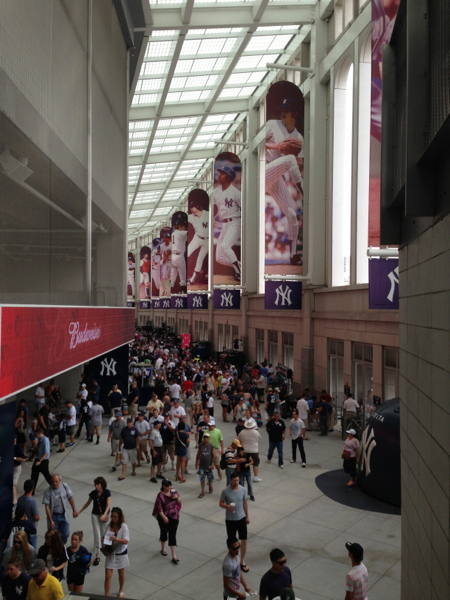 If you are ever in New York, try and make it to a game at Yankee Stadium, you can watch the crowd as much as the baseball and learn a little more about America’s favourite pastime… and about the passion that drives it. This entry was posted in Baseball, Sports on 2013/08/05 by Justinus.